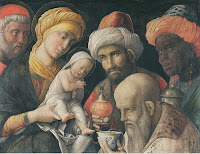 The Magi were disciplined and focused in ways that I’m often not. They didn’t let one day roll into the next. They studied their own history and sacred texts in a way that prepared them to recognize a sign of something special when it appeared. And even though they were clearly fine scholars, they didn’t always have their noses stuck in books. They paid attention to the world around them, and were motivated to respond by what they saw. Once they saw the star, they got their feet moving to go and check it out, rather than just sitting and talking about it with the first person to walk through the door. They knew their knowledge was limited. So they asked directions along the way: sometimes in the right places, and sometimes in the wrong places, like when they asked Herod which way they should go. Once they reached their destination and had accomplished what they set out to do, even then they remained vigilant, learning they couldn’t stay with the child long and should not go back the way they had come. What do you think this year might be like for any of us if approached it with that kind of mentality? Not with a half-hearted list of resolutions, but with a keen sense of who we are and where we come from, combined with attentiveness and openness to what’s going on around us. Add to that readiness to listen to something you can’t quite explain and a willingness to strike off for someplace you’ve never been before, asking directions along the way. It’s hard to know where we might end up or who we might encounter along the way, but I have no doubt but that God is ready to lead us and guide us to insights and experiences we’ve never even dared imagine.